The fully air-conditioned "A" class Emmantina Hotel is conveniently situated in the fashionable beach resort of Glyfada, just 15 km. from the heart of Athens. The beach is only 200 m. away and Glyfada Square, with its modern shopping centres, tavernas and bustling nightlife is only a few minutes walk. The 18-hole international championship golf course is 1 km. away and remains open throughout the year. All guestrooms are air-conditioned, sound insulated and comfortably furnished. Amenities include colour television with satellite channels, in-house video and cable T.V., electronic safes, direct-dial telephone, radio, private bathroom and balcony overlooking the Saronic Gulf. High speed Internet access is also available. The hotel's elegant restaurant is open for breakfast, lunch and dinner. The 'A La Carte' menu features many delicious Greek and international dishes. The room service catalogue offers a variety of light snacks and drinks. 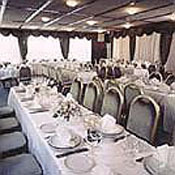 Other facilities include a comfortable cocktail lounge, a banquet room for special occasions and computer facilities, including Internet surfing. Open during the summer until the early hours of the morning, the hotel's green roof-garden with its sparkling swimming pool is a sun-worshipper's paradise. Guests can spend a leisurely day choosing from a selection of snacks and ice cream or enjoying the magnificent view with their favourite drink from the poolside 'Bikini Bar'. There are also facilities for billiards, darts and backgammon. 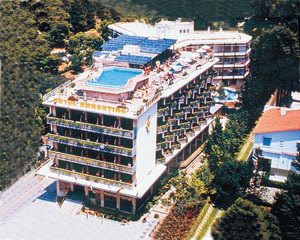 "Vinilio" discotheque operates seasonally on the hotel's premises. The hotel's vast experience in organising seminars, together with the latest in audio-visual equipment will guarantee the success of your meeting.